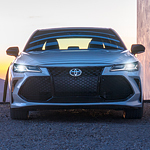 Another of the Toyota Avalon performance features is adaptive variable suspension. The adaptive variable suspension automatically initiates damping adjustments. The end result of this systemic process is maximized handling and stability when driving. This makes the new Avalon ride more comfortably. It also enhances the safe operation of the Toyota Avalon significantly. Find yours at our dealership today!